I’ve wanted to visit The Kelpies, in Falkirk, Scotland, for some time. Of course I’ve seen photos of them, but wanted to see them for myself. And then, this afternoon, when I was driving along the M9, there they were in all their glory. I took the slip road and found my way to Helix Park, got out the car and braved the cold and wind to visit them. And it was well worth it. Designed by sculptor Andy Scott, they celebrate the work horses of the Industrial Revolution, a time when huge horses drew barges along the canals and wagons along rough roads. Wow! Is it really so long since I last added a post. I guess so. 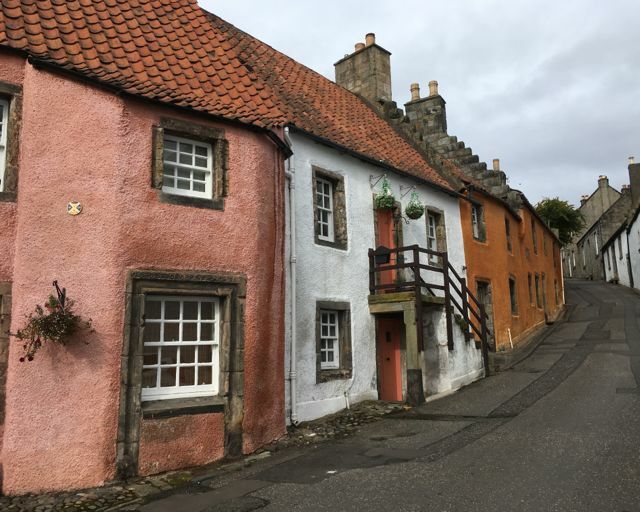 But perhaps the biggest highlight for me was visiting the town of Culross (pronounced q-ross), in Fife, not far from Edinburgh on the other side of the Forth. 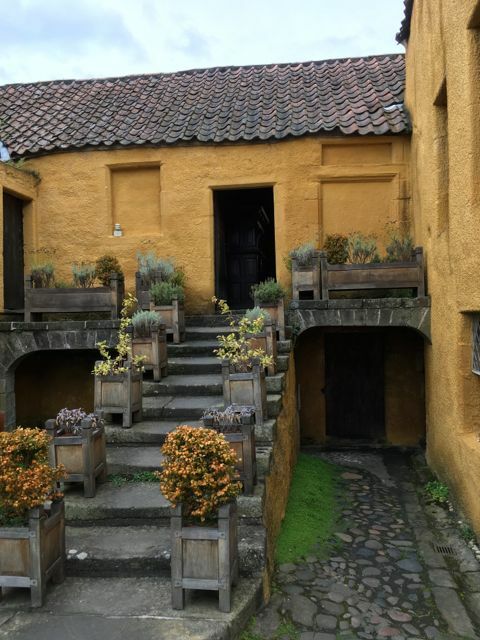 As the guide-book says, ‘Culross is a town which time has passed by; the most complete example in Scotland today of a burgh of the 17th and 18th centuries’. Not the Mediterranean but Culross Palace courtyard. If the town reminds you of a film set, it is, in fact, frequently used as one! 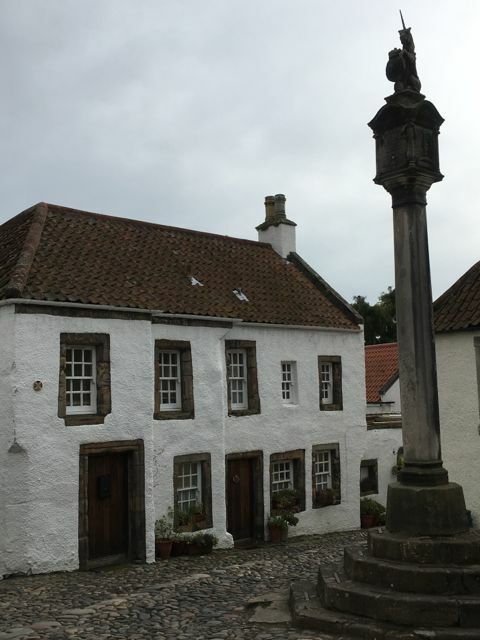 If you are a fan of Diana Gabaldon’s Outlander, many of the buildings are instantly recognisable, including Geillis Duncan’s home, or the market cross where a young lad has his ear nailed to a post. Lost in time it may be, but it is a thriving community. There’s little I can say to adequately describe what a fascinating place Culross is. 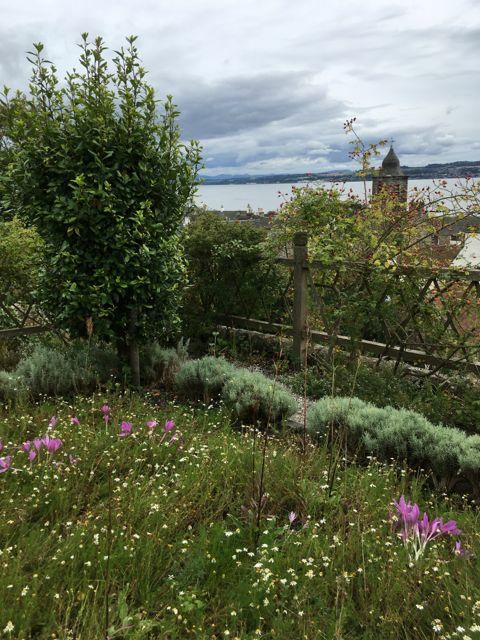 From its Palace and garden, to the Town house, Stinking Wynd (don’t worry, it doesn’t smell), Mercat Cross, House with Evil Eyes, Abbey and Abbey House, to the stunning views across the Forth, not to mention the great coffee shops, there’s something for everyone. Although I was born and brought up in Scotland, I’ve lived overseas for so long now, that sometimes I forget just how rich and humorous and wise some Scottish sayings are. ANE AT A TIME IS GUID FISHIN’. (One at a time is good fishing.) Be content with your life. Don’t look for everything at once. MONY A MICKLE MAKS A MUCKLE. (Many small things make a lot.) Lots of little things add up into big things. AULD CLAES AN’ CAULD PORRITCH. (Old clothes and cold porridge.) After a period of expense, it’s back to basics. Or… after a holiday, it’s back to real life. 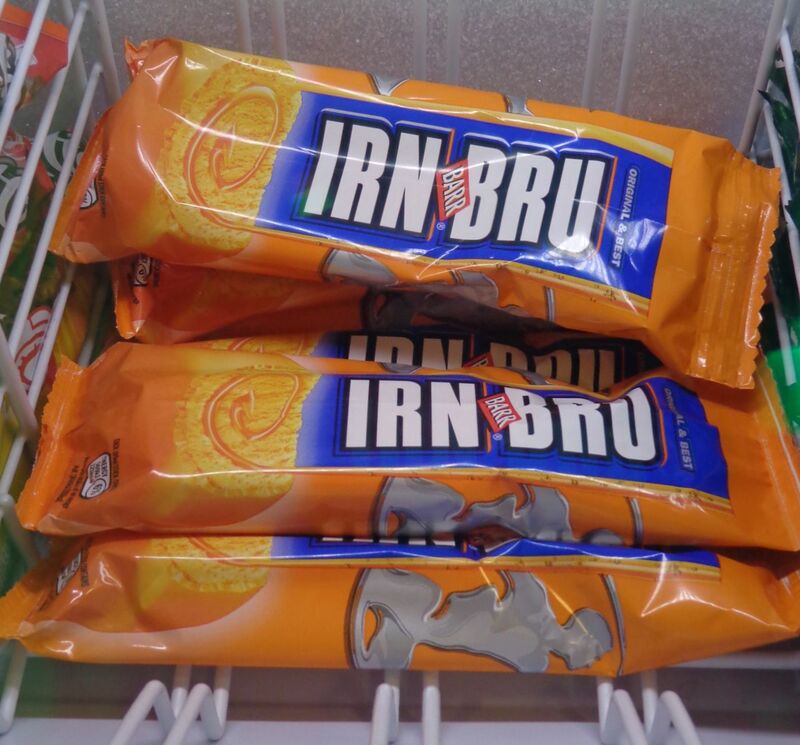 WEANS WI’ BIG LUGS TAK IT A’ IN. (Children with big ears take it all in.) Watch what you say in front of the children. All cities have their iconic streets. One of my favourites is Byres Road in Glasgow’s West End. It stretches from the working class district of Partick at one end, to the beautiful Botanic Gardens and mansions of Great Western Road at the other. With both the University of Glasgow and, until their recent move to Pacific Quay, the BBC Scotland studios close by, it has a vibrant, diverse feel to it. Visiting Byres Road on my trips back to Scotland, it remains familiar, and yet new enough, to still excite me. I love how Byres Road honours its past by not knocking down ‘old’ buildings, but by repurposing them, turning an old church into a theatre, and an art deco cinema into a restaurant. The city – and street – is alive! My grandparents used to live about halfway up Byres Road, and I spent a lot of time there when I was a wee girl. Much has changed since then. The pork butcher shop, which I remember having tiled walls, carcasses hanging from hooks which dripped blood onto the sawdust covered floor, is now an Oxfam shop, while Colquhouns, where we used to go for lunch on a Saturday, now houses a Pizza Express. Across the road from their flat was Ashton Lane, now a trendy mews, with the famous Ubiquitous Chip restaurant and entrance to the Grosvenor Cinema. Byres Road has many of the stores you expect to see on any High Street – Boots, Marks and Spencer Food etc – but there are some great independent shops too where you can buy unique gifts. And if you fancy getting a cup of coffee from ‘The Tardis’ you’ll find that there too! The butcher shop I remember has long gone, but down near the Partick end there’s another butcher with a good sense of humour. I used to hate potted meat! Yes, I guess that means I was a ‘toff’. And if you fancy stepping back into history, pop into Curlers Rest (formerly Curlers) for a drink. Established in the 17th century, it used to stand beside a pond where – you guessed it – they curled in the winter. 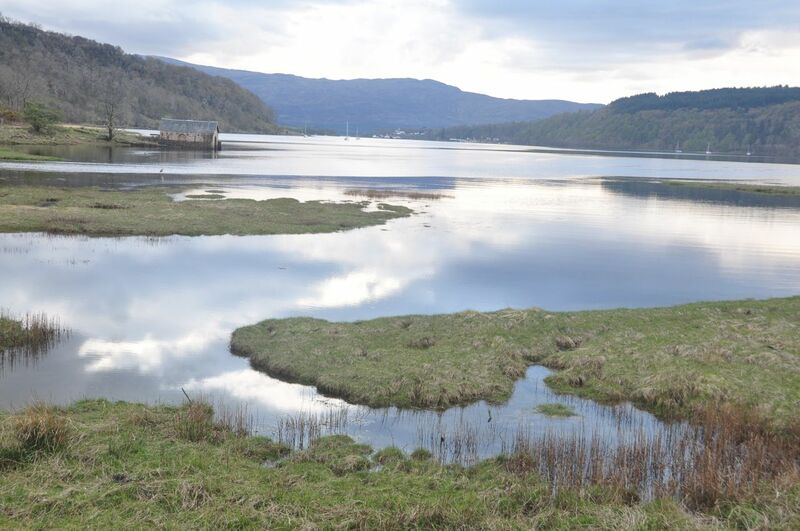 As an emigrant from Scotland, and with Burns Night almost upon us (January 25th), it can be all too easy to get caught up in twee images of Scotland and its music. You know what I mean – pipers marching through the glens, kilts a-swinging, belting out Scotland the Brave. And while there is definitely a place for all that, my visit back to Scotland for The Perthshire Amber Festival last October, really opened my eyes to the vibrant contemporary Folk Scene that currently exists in Scotland. Especially in the world of piping, where I was introduced to the music of Ross Ainslie. What can I say apart from – What a musician! With his tattoos, long hair and ripped jeans, he is definitely not your traditional image of a piper. Unfortunately, none on the photos I took at his concert turned out, but here’s a wonderful clip of him performing from Youtube. Check it out. The energy of the music is intoxicating and exciting.